Dr. Samir Farag Born in EGYPT, Port Said, and honored to serve Egypt in both Military and Civil posts. He held the positions of Manager of “Moral Affairs”in Armed Forces and the Governor of Luxor City and Manager of Opera House. He Graduated from the Egyptian Military Academy and joined the Infantry. He got a Bachelor degree in Arts, majoring in History, Ain-Shams University then a Diploma in Business Administration, USA and finally the PhD in Media. Samir Farag is considered one of the top ranked Egyptians in his profession. By combining both academic and professional practice, accompanied by his outstanding communication talents, he built a rich diversity of experience in the fields enterprise-level management in both Military and Civilian environments. Head of the Army Moral Affairs Department (1993-1999). Commander of an Infantry and Mechanized Division. Key positions at the Armed Forces Operations Authority. Key positions at the Military Research Authority. Office Manager for the Head of the Military Intelligence. Teacher at the Infantry Institute and Staff College. Teacher at the Royal Staff College, Camberley, England. The FIRST officer to teach from outside the NATO and the Commonwealth. Military Attache in Ankara, Turkey. Chairman & CEO of NAT Energy (2011-now). Chairman of the Supreme Council of the City of Luxor (2004-2011). 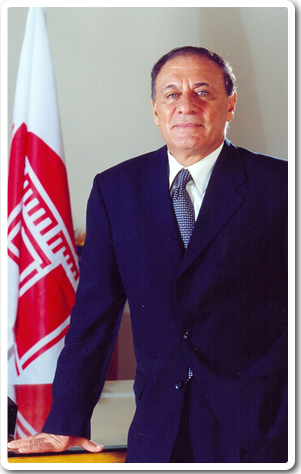 Chairman of the National Cultural Center (Cairo Opera House) (2000-2004). First Under-Secretary for the Ministry of Tourism. Board member of the Faculty of Art, Ain Shams University. Board Member of the American Egyptian Council. Representing Egypt for two years at the Institute of Strategic Studies, London. Board member of south valley universities. Bachelor degree in Arts, majoring in History, Ain Shams University. A diploma in Business Administration, USA. Masters degree from Egyptian Staff Collage. Graduate of Nasser Higher Military Academy, (FIRST in class). Graduate of Royal Staff College, Camberley, England (FIRST in class). Graduate of the Egyptian High War College (FIRST in class). Prepared “Luxor Master Plan 2030,” a 25 year visionary planning for the City of Luxor, which won second place award for best cities and capitals in the Islamic World, 2007. Implemented Phase I of Luxor Master Plan, with a total of 42 projects done in 3 years. Succeeded in moving the 3200 families of “Al Qarna Village” that resided over ancient tombs for over 100 years, & established the “New Al Qarna Village” for these families. Renovated and developed the front area of Luxor Temple and Abu El Haggag Mosque. Renovated and developed the front area of Karnak Temple and demolished all unauthorized buildings blocking the temple scene. Started the “Reopening of Sphinx Road (Dromos)” between the Temple of Luxor and the Karnak Temple which should turn Luxor into THE WORLD’S LARGEST OPEN AIR MUSEUM. Established the Cultural Heritage Center, adding a new tourist night in Luxor. Established the “Nubian Village” to preserve the Nubian heritage for more than 25000 Nubians living in Luxor. Restored Abu El Haggag Mosque, Luxor. Renovated the Luxor Railway Station, now the best in Egypt. Renovated different tourist attractions in Luxor, including streets and bazaars. Established the International Rowing Club. Established the Women Cultural Center. Established Al Tod Butane Factory. Developed Hassan Fathy Village, West Bank. Introduced and applied e-government system and services in Luxor. Renovated and developed all the hospitals of Luxor. Established the new Luxor Market. Established the first specialized library in the Middle East in the field of Egyptology. Renovated Sayed Darwish Theater in Alexandria Opera House. Renovated and reopened Arabic Music Institute. Renovated Al Gomhuria Theater, downtown Cairo. Started “The Opera Stars Project” that helped in discovering talented singers and instrument players from all over Egypt. Established the “Mohamed Abdel Wahab Museum” (famous Egyptian singer). Renovated the Opera House Museum that tells the history of the Egyptian Opera since its establishment by Khedive Ismail. Organized “Opera Aida” at the pyramids of Giza. As chairman of the Opera House, Opera bands participated in all of Egypt’s ceremonial events. Launched the initiative of sending opera bands to Egyptian governorates as part of a full cultural event. Established 6 new rehearsal halls for the Opera bands, a print house inside the Opera. Established a welfare fund for Opera employees. Held numerous concerts at the Cairo Citadel during summer seasons. Established the first Military Media Center. Established the first Military Audio and Video Center. Established the first Military psychological Affairs Center. In 1975, participated in a live debate with Ariel Sharon (former Israeli Prime Minister) about the October war, BBC television, London. Organized the October War Strategic Seminar on the occasion of the 25th war celebrations. An achievement award from the Cairo International Book Fare for organizing the October War Strategic Seminar. Wrote numerous books, researches and articles, especially in the field of military science with a focus on the philosophy of combat in the Western creed. Honored by EU for converting Luxor to the largest open museum and the re-open of “Sphinx” road.